The savory flavor and recognizable smell of freshly picked and dried tobacco leaves is now accessible in e-Liquid. Indulge your taste buds with this powerful essence thats popular with both long-time smokers and people simply wanting to relish a yummy vape. Our regular tobacco flavor is compared to the aromatic, contemporary flavor of a hand rolled cigarette or packed pipe tobacco and can satisfy your want for a full, tasty vape. With the perfect blend of an 80/20 PG/VG mix (propylene glycol and vegetable glycerin (organic, food grade preservative compounds), you'll get the best flavor concentration along with the perfect amount of vapor to satisfy your vaping needs. 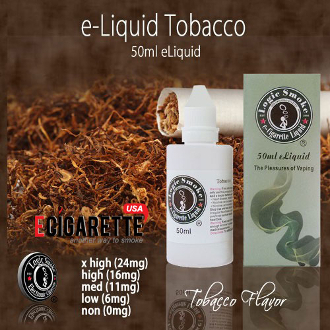 The 50ml bottle is a convenient and economical size for purchasing in quantity. Fill your clearomizer or other e-liquid atomizing device directly from the bottle or use it to refill your smaller travel-size e-liquid bottles. You'll be ready and have liquid on-the-go at any time.